Carbon dioxide emissions from industrial society have driven a huge growth in trees and other plants. A new study says that if the extra green leaves prompted by rising CO2 levels were laid in a carpet, it would cover twice the continental USA. Climate sceptics argue the findings show that the extra CO2 is actually benefiting the planet. But the researchers say the fertilisation effect diminishes over time. They warn the positives of CO2 are likely to be outweighed by the negatives. 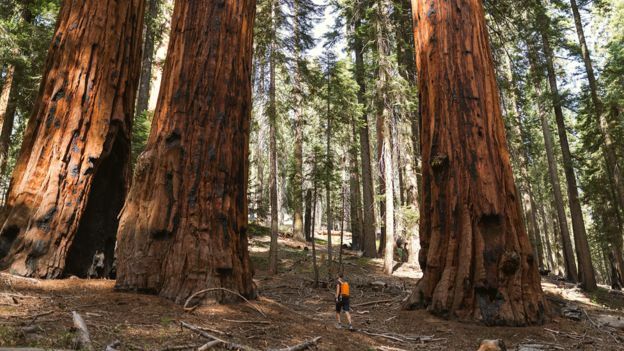 The lead author, Prof Ranga Myneni from Boston University, told BBC News the extra tree growth would not compensate for global warming, rising sea levels, melting glaciers, ocean acidification, the loss of Arctic sea ice, and the prediction of more severe tropical storms. The new study is published in the journal Nature Climate Change by a team of 32 authors from 24 institutions in eight countries. 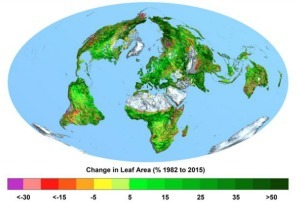 It is called Greening of the Earth and its Drivers, and it is based on data from the Modis and AVHRR instruments which have been carried on American satellites over the past 33 years.The sensors show significant greening of something between 25% and 50% of the Earth’s vegetated land, which in turn is slowing the pace of climate change as the plants are drawing CO2 from the atmosphere. Just 4% of vegetated land has suffered from plant loss. This is in line with the Gaia thesis promoted by the maverick scientist James Lovelock who proposed that the atmosphere, rocks, seas and plants work together as a self-regulating organism. Mainstream science calls such mechanisms “feedbacks”.